At Albion Hills Physiotherapy, we can provide you with a custom fitted knee braces. We can custom fit you with a brace right on premise to help you return to your normal activities of daily living as fast as possible. help assess what type of brace is best for you. Our wide range of rehabilitation and post-operative knee braces provide an excellent fit, giving comfort and support to the one wearing it. 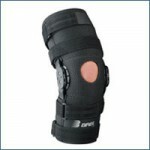 Give us a call today to schedule your knee brace fitting appointment. We also have a great selection of “Off the Shelf” supports. Products include wrist and forearm splints, hand and finger splints, abdominal binders, back supports, elbow braces, ankle products, knee immobilizers, and plantar fasciitis splints.